WASHINGTON, April 18 -- Builder confidence in the market for newly-built single-family homes remained unchanged in April at a level of 58 on the National Association of Home Builders/Wells Fargo Housing Market Index (HMI). "Builder confidence has held firm at 58 for three consecutive months, showing that the single-family housing sector continues to recover at a slow but consistent pace," said NAHB Chairman Ed Brady, a home builder and developer from Bloomington, Ill. "As we enter the spring home buying season, we should see the market move forward." "Builders remain cautiously optimistic about construction growth in 2016," said NAHB Chief Economist Robert Dietz. "Solid job creation and low mortgage interest rates will sustain continued gains in the single-family housing market in the months ahead." There will be no recession in 2016! Despite all the news to the contrary, the US econ my is in pretty good shape, better than the financial pundits think. Sure, the stock market has taken a battering of late, exploration and production activity in the oil patch has been declining, and exports are performing poorly, but the rest of the economy is fine. The service sector continues to grow nicely and construction activity continues to increase. Let’s take a closer look at the facts. The recent tumble in equity prices has nothing to do with a slowing economy and is not the precursor of a recession. Rather, the declines are the result of three quite independent factors. First, as the Fed raises interest rates, the value of financial assets must decline. Remember, the Fed initially lowered rates to boost asset prices and stimulate spending. As this process slowly unwinds, the value of equities must decline. Second, corporate profits have been flat for several quarters, and third, even at today’s somewhat lower equity values, P/E ratios remain high by historic standards. As for exports, the US is much less dependent on them than most nations. Exports of goods to China total less than one percent of GDP, while exports of goods to Europe are about 1.5% of GDP. While exports of services such as movies, music and intellectual property add to these totals, they do not vary much with economic conditions. As a result, while a 10% decline in exports certainly hurts manufacturers and their employees and reduces GDP by about 0.2%, it is far from catastrophic in an economy growing by a healthy 2.5%. Regarding falling oil and gas prices, the benefits to the economy are just beginning. Until now, the price declines have resulted in large cutbacks in exploration and production (E&P) activity, as well as related manufacturing, construction and oil services activity that supports oil and gas E&P. The key here is that cheaper energy prices have boosted household incomes by about $130 billion or $1,000/household. While to date most of this money has been socked away, I expect that to change and to see increased consumer spending this year and next as households perceive the recent price declines as somewhat permanent. Most importantly, the rest of the economy is already doing well. Unemployment is at 4.9% and will decline further as the year progresses, and at 4.9%, unemployment is already at one of the lowest levels in decades. Moreover, home sales and prices are up, as is loan demand. In addition, tight labor markets are finally leading to sizable increases in hourly earnings, which will boost household spending further, and inflation, which has been completely dormant for several years, appears to be rising. This is a particularly welcome development given that Japan and Europe continue to fight deflation. Lastly, services, which account for roughly 84% of GDP, and construction activity, which accounts for about 6% of GDP, both of which are almost entirely domestically focused, are in fine shape and growing nicely. During the past 12 months, construction activity increased by 10.4% and services grew by 3%. In short, the parts of the economy that are inwardly-centered are doing well, and the negative impacts of softer growth from abroad are not nearly strong enough to derail our economy. As for the upcoming election, let’s fervently hope that the threats to dramatically raise taxes or increase the deficit do not come to pass. WASHINGTON - The Department of Labor's new union persuader rule violates business owners' First Amendment rights, making it nearly impossible to consult with legal counsel when facing union organizing, said the National Federation of Independent Business (NFIB) and the National Association of Home Builders (NAHB). "Once again, the administration is rigging the game in favor of workplace unionization," said NFIB Small Business Legal Center Executive Director Karen Harned. "The DOL is putting small employers at a profound disadvantage. "Unions pay people whose full-time job is to organize workers," she continued. "Small employers have businesses to run. They don't have in-house lawyers or compliance officers to guide them through the process or navigate the complicated rules governing union organizing." Ed Brady, chairman of NAHB and a home builder and developer from Bloomington, Ill., said that the rule is fundamentally unfair because it requires employers to report to the DOL whether and when they consult with a lawyer to discuss union organizing. The unions, on the other hand, aren't encumbered by any such requirement. "DOL's final persuader rule is another example of regulatory overreach that will impose far-reaching reporting requirements on employers and their consultants and result in significant monetary and legal implications for home building firms," said Brady. "This lawsuit is necessary to maintain long standing policy on what union-related communications between employers and attorneys remain confidential." NFIB and NAHB joined the Texas Association of Business, the Texas Association of Builders and the Lubbock Chamber of Commerce late yesterday in filing a lawsuit against the DOL in the United States District Court, Northern District of Texas, Lubbock Division. The business groups maintain that the rule violates the First Amendment's guarantee of freedom of speech and right of association. Also, according to the plaintiffs, the rule violates the Due Process Clause of the Fourteenth Amendment and the Regulatory Flexibility Act (RFA). Previously, owners were only required to report when outside counsel directly communicated with employees. Under the new rule business owners will have to report any communication with legal counsel even if the matter ends there. The persuader rule will take effect on July 1, 2016. Remodelers who are certified by the Environmental Protection Agency (EPA) to work on homes that may contain lead paint under the Lead: Renovation, Repair and Painting (RRP) rule now have the option to complete refresher training online, according to an EPA announcement. However, EPA re-certifications obtained via an online refresher course will be valid for only three years – versus five years for hands-on training courses – and can only be exercised every other re-certification cycle. Additionally, certified renovators who were grandfathered in under a HUD or EPA lead-based paint training course before the RRP rule was adopted must attend a refresher course with a hands-on component. The rule also made several streamlining and clarifying changes to RRP provisions that apply to training providers. EPA’s changes only apply to Minnesota and other states where EPA administers the program. The 14 states that administer their own programs will have to take legislative or regulatory action to adopt the online refresher course option. The White House Office of Management and Budget released the final rule to EPA on Jan. 21. For online or in-person refresher training, remodelers should contact their local home builders association, or they can find a course on EPA’s website. When is renovator refresher training required? 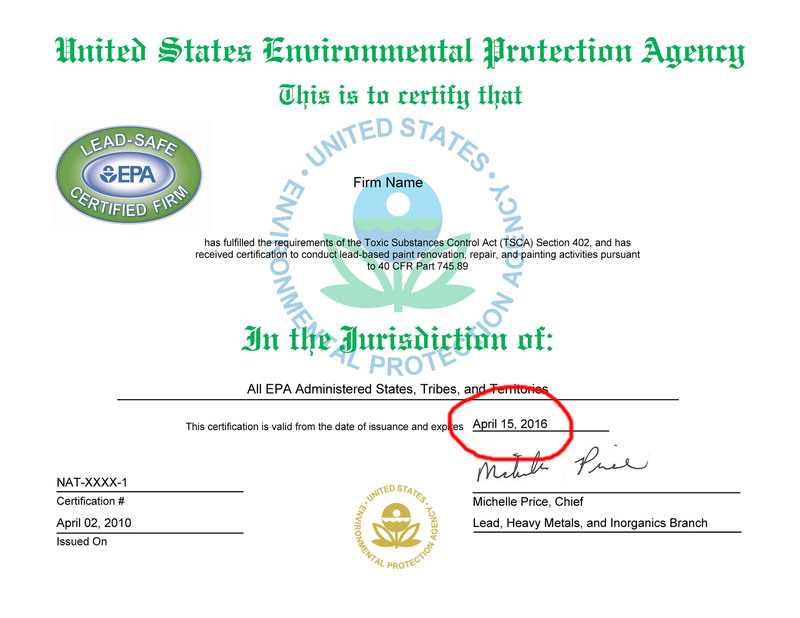 EPA extended the training expiration date for many certified renovators. To determine when a renovator's training has expired take a look at the table below. Expiration dates are based on when the previous course was taken. Please note that certifications begin to expire on March 31, 2016; renovators in that group must take refresher training by that date in order to have valid certification. Note: The extensions do not apply to firm certifications. On or after April 1, 2011 - No extension provided. Initial courses and refresher courses with hands-on. The expiration is 5 years from the date of course completion. Refresher courses without hands-on (done entirely online). The expiration is 3 years from the date of course completion. All firm applications (certification and recertification), payments, updates and certificate replacement requests are done online. Acceptable methods for payments online include credit card, debit card, or electronic check. Use EPA's "Look for the Logo" campaign to promote your business! As you know, EPA's RRP requires firms working in older homes and child care facilities to be certified, train their employees, and follow lead-safe work practices. To ensure that your potential customers hire a Lead-Safe Certified firm, help spread the word by using EPA's outreach materials to remind everyone to "Look for the Logo"! For more information or to download the materials for free, click here. Help us encourage your potential customers to "Look for the Logo". Feel free to place the widget on your webpage and highlight the print ad in an upcoming customer newsletter or email. Firms that disturb painted surfaces in homes and child care facilities built before 1978 are subject to EPA's renovation regulation and likely require firm certification. These firm certifications expire every five years. Firms must apply for recertification to extend their certification an additional 5 years. Firms are encouraged to apply early, at least 90 days before their expiration, to ensure their application is processed before they expire. You won’t be penalized for applying early, just be sure to select “re-certification” and your new 5-year certification won’t begin until your current certification expires. Click here for information about applying for re-certification. FYI, check your certificate for your firm's expiration date (see example firm certificate below, the expiration date is circled in red), you can also check your expiration date using our online firm search tool. If necessary, you can order a copy of your certificate online. Once submitted to EPA your application will be processed in 2 to 3 weeks. Once finished you will receive an email from flpp.notify@epa.gov that includes your approval letter, certificate, and customized logo. Please check your email settings to ensure you'll receive this message. You can also check the status of your application and download a copy of your certificate once issued by going to EPA's E-Enterprise website. Use your CDX user name and password for access. Your application information appears under the "progress tracker" section. To date, EPA has authorized 14 states to run their own renovation programs. Renovators and firms that only work within an authorized state(s) must be certified by each authorized state in which they do work, and would not be required to be certified by EPA. The authorized states are AL, DE, GA, IA, KS, MA, MS, NC, OK, OR, RI, UT, WA and WI. If an individual renovator is certified by an authorized state they are also qualified to work in EPA administered states, with no additional training. EPA certified renovators wishing to work in an authorized state should contact the state to determine if additional training/certification is necessary. Regardless of whether a firm is certified by an authorized state, if they do work in an EPA administered state they must be certified by EPA. Click here to see the FQ’s related to this topic. EPA maintains a list online of Frequent Questions regarding the Agency's Lead Program. It is regularly updated to ensure that you have access to the very latest information. When questions come up we recommend you first review the Frequent Questions, then if you cannot find the answer you're looking for call the National Lead Information Center at 1-800-424-LEAD (5323). Here's an example from the FQ database. Can the required records and documentation be stored electronically rather than as paper copies? The answer is “yes, the records can be stored electronically”. Take a look at FQ 23002-32220 for more details! · If you add the Chamber Connection attendees 180, 879 vendors, and those coming to the show the last hour after ticket sales were closed, we had approximately 5,300 walk the HomeShow this year. o 20 CMBA members /staff attended the Builder Day at the Capitol on March 15 and met with 7 area legislators on building related issues. 250 Minnesota building industry professionals attended the day. o Publisher of the Tour of Homes – HomeShow magazine, 30,000 distribution, through SC Times and at Holiday Stations. There were 4 - 3 day passes sold in 2016. HomeShow Events You Don't Want to Miss! 2016 CMBA HomeShow Events You Don't Want to Miss! It’s time again for the largest home building show in Central Minnesota, CMBA’s 44th annual HomeShow! The event will be taking place March 11-13 at St. Cloud River’s Edge Convention Center. There will be many activities taking place throughout the weekend - kids activities, food and beer sampling, auctions, seminars, and so much more. What would an event be without music? Classic country singer Alan Godage will be here Friday from 2 pm to 7 pm. So, put on your boots and come enjoy great music and company! While you listen to Alan, celebrate fish fry season with the HomeShow’s fish fry, from 4 until 8 pm. The HomeShow is open 12 pm to 8 pm on Friday. Chris Grundy’s two shows Cool Tool and Blog Cabin will be featured during this special appearance. He knows everything about creating spectacular renovations - you will not want to miss this opportunity to learn from the best! You can see him on Saturday at 11 am, 2 pm, and 5 pm on the American Door Works Stage. Also on Saturday, come get some gardening tips from Joel Karsten. As the author of Straw Bale Gardening, Joel has great advice for your gardening needs. His unique style of gardening features beautiful vegetables grown without soil. You can catch him on Saturday at 10 am, 1 pm and 4 pm. A highlight of this year’s show you won’t want to miss is the enchanted garden built by area landscapers. A plant sale will also take place on Sunday at 3 pm. There is always time to gain more knowledge! We will have four Premier Real Estate classes available on Saturday. · 10 am: Preparing Your Home To Sell - Learn tips to increase the value of your home. · 11 am: First Time Homebuyers - Learn everything you need to know about the home buying process. · 1 pm: Make Your Home Smart - Learn about all the newest devices and apps to transform your home. · 2 pm: Making Money In Real Estate - Learn about short term and long term investing, how to pick out good properties, and the smartest ways to invest your money in real estate. On Saturday and Sunday at 11 am, bring your kids to make and take home their own framed wipe off-board. Plus, win a playhouse donated by Gulfeagle Supply! Organic Gardening is on the rise! Bobby Jensen has all the advice you need to start organic gardening from your kitchen cabinet. As the co-host of the Grow With KARE segment on Kare 11, he’ll be able to answer your burning gardening questions. You can catch his appearance on Sunday at 12 pm and 2 pm. Also hear from Nick Olsen on Beekeeping, 11 am and 1 pm. A $200 Garden Apiary will be given away after his 1 pm seminar. See Webinars for Small Businesses for upcoming National and Local Webinars. The Internal Revenue Service is sponsoring a Spanish Webinar on Recordkeeping, How to find a Tax Return Preparer and IRS Resources that are available in Spanish. Register to attend this important informational event! El Servicio de Impuestos Internos está patrocinando un Webinar en español. Venga a escuchar cómo mantener registros, cómo encontrar un preparador de impuestos y los recursos del IRS que están disponibles en español. ¡Regístrese abajo para asistir a este importante evento informativo! Scam Calls and Emails Using IRS as Bait Persist. Phishing Remains on the IRS “Dirty Dozen” List of Tax Scams for the 2016 Filing Season. The IRS warned taxpayers to watch out for fake emails or websites looking to steal personal information. Criminals pose as a person or organization you trust and/or recognize. They may pose as a bank, credit card company, tax software provider or government agency. Criminals go to great lengths to create websites that appear legitimate but contain phony log-in pages. These criminals hope victims will take the bait to get the victim’s money, passwords, Social Security number and identity. If a taxpayer receives an unsolicited email that appears to be from the IRS, report it by sending it to phishing@irs.gov. Are you making charitable donations? Know how to determine the fair market value for non-cash donations. See Determining Fair Market Value in Publication 526 Charitable Contributions. See Publication 561 Determining the Value of Donated Propertyfor more information. · The Affordable Care Act requires you and each member of your family to have minimum essential coverage, qualify for an insurance coverage exemption, or make an individual shared responsibility payment for months without coverage or an exemption when you file your federal income tax return. · You, your spouse or your dependents may be eligible to claim an exemption from the requirement to have coverage and are not required to make a payment. For any month that you do not qualify for a coverage exemption, you will need to have minimum essential coverage or make a shared responsibility payment. · You can claim most exemptions when you file your tax return. However, you must apply for certain exemptions in advance through the Health Insurance Marketplace. For purposes of the Affordable Care Act, employers average their number of employees across the months in the year to see whether they will be an applicable large employer. This is important to do because two provisions of the health care law apply only to Applicable Large Employers (ALEs) and are now in effect. See Determining if an Employer is an Applicable Large Employer for more information. Some of the provisions of the Affordable Care Act only affect your organization if it’s an applicable large employer. An ALE is generally one with 50 or more full-time employees, including full-time equivalent employees. The vast majority of employers will fall below the ALE threshold number of employees and, therefore, will not be subject to the employer shared responsibility provisions. If you are an ALE, here are five things to know. The IRS knows identity theft can be frustrating and confusing for victims. When it comes to tax-related identity theft, the Internal Revenue Service wants to resolve cases as quickly as possible. The IRS has worked hard to help victims of identity theft by making improvements and shortening the time it takes to resolve these complex situations. Each taxpayer’s experience will vary, depending on whether they tell the IRS they may be a tax-related identity theft victim or the agency informs them there may be have been a suspicious tax return filed with their name on it. Further, the IRS may not realize the taxpayer is an identity theft victim until their return has been processed or an audit has been initiated. See IRS Identity Theft Victim Assistance: How It Works for a general outline of what you can expect. o Are there other steps I should take as a tax-related IDT victim? See all “IRS Security Awareness Tax Tips” here. From Business USA: What better time than tax season to pass along some of our best advice? Never Miss An Important Deadline Again. Take advantage of the IRS's free Tax Calendar for Businesses and the Self-Employed and never miss a date. Make Sure Your Returns Are Error-Free. Get your return right the first time by avoiding these eight tax mistakes. Don't Leave Money On The Table. Take advantage of BusinessUSA's taxes and credits tool to make sure you're not overpaying. · The Small Business Administration, the Department of Health Human and Services, and Small Business Majority have teamed up for a free webinar series where small employers can learn the basics of the Affordable Care Act and what it means for their organization and employees. · Topics covered include the Small Business Health Care Tax Credit, the new Health Insurance Marketplace, and Employer Shared Responsibility and new employer reporting requirements. Webinar content will generally be the same each week. · See this page for registration links for winter 2016. · "When does my passport expire?" · This is a question we ask ourselves before any big trip. If you haven't checked your passport's expiration date in a while and are planning a trip overseas, you could be in for an unpleasant surprise. Passports expiring in 2016 must be renewed as soon as possible. · Some countries are also now requiring that you have a passport that has been valid for at least 6 months. As spring and summer travel plans come up, passport agencies become even busier. · So don't put it off and renew your passport today! For more information on overseas travel, visit USA.gov. · Find the latest IRS news via Social Media options. The Issue Management Resolution Systemhelps solve issues with policies, practices and procedures. Tax professionals should forward significant issues regarding IRS policies, practices and procedures to their Stakeholder Liaison. Outreach Corner. Find it easy to spread the word about key income tax topics! This page offers electronic communication materials to use in reaching out to the people you serve. Get free news you can use each month, targeted by time of year to coincide with what your customers, employees, volunteers, etc. need to know about new tax law legislation, IRS events and other activities that affect them. Industries/Professions Tax Centers. Tax Centers contain links to topics such as tax tips, financial resources, trends and statistics, forms, and more. Audit Techniques Guides (ATGs) help IRS examiners during audits by providing insight into issues and accounting methods unique to specific industries. While ATGs are designed to provide guidance for IRS employees, they’re also useful to small business owners and tax professionals who prepare returns. With the economy and housing market still recovering, some potential first ­time home buyers may be hesitant to invest in a new home. There are, however, several reasons why now is a great time for Millennials and other first­ time home buyers to start building their American Dream. Today’s historically low interest rates are helping first­ time home buyers find affordable housing options. Average weekly interest rates for a 30­ year fixed mortgage remain under 4.5%. It’s important to keep in mind that interest rates are sensitive to market forces and can change quickly. There’s no indication that rates will suddenly surge upward, but even a slight rate increase can push monthly payments to the point that a buyer might miss out on their first choice for a new home. While lenders are looking more closely at borrowers today than in recent years, there are options for purchasing your first home without a 20% downpayment. For example, the Federal Housing Administration (FHA) offers loans to first­ time home buyers with down payments as low as 3.5%. However, these loans require mortgage insurance. To ensure that the financing process goes smoothly, buyers should consider pre­-qualifying for a mortgage and having a financing commitment in place before shopping for a new home. Buyers also may find that some home builders have arranged favorable financing for their customers or offer financial incentives. Designed to accommodate today’s busy lifestyles, new homes – including urban condos and single­ family homes – feature open floor plans, flexible spaces, low­-maintenance materials and other amenities that appeal to younger buyers. Today’s tech­-savvy home buyers use mobile apps to quickly gather all of the key information on a property and to see extensive photos from their cell phones or tablets. If you’re just beginning your search, Realtor.com is a popular app because it generally contains the most accurate information gathered from more than 800 local MLS’s (multiple listing services). If you’re checking out homes in an unfamiliar area, AroundMe helps you get a quick sense of the neighborhood by telling you the location of local restaurants, supermarkets, businesses, and attractions nearby. There also are several free mortgage apps to help you determine how much you can afford and to compare real­-time rates from multiple lenders. Popular mortgage calculator apps include Zillow and Trulia. For most Americans, homeownership is a primary source of net worth and is an important step in accumulating personal financial assets over the long term. Although property values have declined in many markets, Americans have more than $10.8 trillion of equity in their homes, and for most families, home equity represents the largest share of net worth. At the same time, rent prices continue to climb – 2.8 percent in 2013 – as rental vacancies dropped to their lowest point since 2000, according to a recent report from Harvard University’s Joint Center for Housing Studies. That makes now a great time to start investing in your future instead of your landlord’s. For more information on resources for first­ time home buyers in Central Minnesota, visit nahb.org/forconsumers. A top priority of the CMBA Board of Directors is to provide more membership benefits. In doing so, we are offering free continuing education for builders licensing to members, and we have absorbed the last two $16 National Association of Home Builders (NAHB) dues increase, as well as the 2014, 2015 and 2016 legal action fund assessment of $35-$25 from Builders Association of MN (BAM) rather than passing these on to the members. Another goal is to enhance the HomeShow by adding an Outdoor Living display and expanding the Homeshow at no additional cost to the vendors. In addition, we are providing each CMBA member with 10 free HomeShow passes to the upcoming HomeShow March 11-13, 2016. Since admission to the show is $5, these tickets hold a $50 value. We hope you will use these passes to attend the show and give them to your clients. We ask that you hang the enclosed HomeShow poster in a high traffic area to help promote the show. We also request that you proudly display the enclosed CMBA Member window cling. Our main HomeShow attraction this year will be Chris Grundy, from DIY Network Cool Tools and Blog Cabins. Tool expert and avid do-it-yourselfer Chris Grundy is living his dream working with tools and chillin' with other home improvement fanatics. DIY Network Blog Cabin is the multimedia experience based on a very simple idea: You Design It, We Build It, You Could Win It! The CMBA Board truly appreciates your support of our association and the local construction industry. We hope you have a safe, productive and profitable 2016. See you at the show! CMBA President, Craig Schoenberg, Schoenberg Construction, Inc.
· Check out “IRS Security Awareness Tax Tips” here <https://www.irs.gov/uac/IRS-Security-Awareness-Tax-Tips> . They’re part of the TAXES. SECURITY. TOGETHER <https://www.irs.gov/Individuals/Taxes-Security-Together> initiative. · Health Care Law: Tax Considerations for Employers with Fewer than 50 Employees <https://www.irs.gov/Affordable-Care-Act/Employers/Tax-Considerations-for-Employers-with-Fewer-than-50-Employees> . · If you missed 10 Cybersecurity Mistakes You Cannot Afford to Make - Tips from the Federal Trade Commission, you can access the recording on YouTube here <https://www.youtube.com/watch?v=KLrnI5ZEl9Y&feature=youtu.be> . You can access the slides here <http://mmsrv01b.intellor.com/sba/2015/Start%20with%20security%20presentation%20-%20for%20SBA%2012-8-15.pdf> . The webinar shared information found in Start with Security: A Guide for Business <https://www.ftc.gov/system/files/documents/plain-language/pdf0205-startwithsecurity.pdf> .